You’ve gotta love the fact that Fringe World will always deliver shows left of centre. Party Ghost is so far left that you’ll be thoroughly gob-smacked at how ooky, kooky and spooky it is. 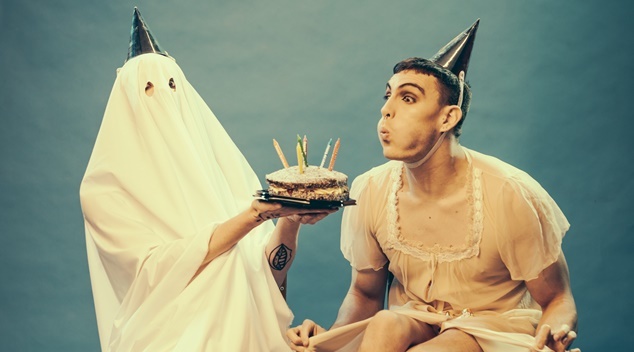 Deliciously macabre, this is a circus show that places whimsy and surrealism firmly at the forefront… while covering it in a white sheet, playing Happy Birthday and then murdering it for comedic effect. And if that image just made you go ‘whoa… what? !’ well, you can expect that, and then some, for a solid 45 minutes. Plus plenty of laughs. You see, Party Ghost takes circus to the afterlife by way of campy and sinister aesthetics that are delightfully demented. On this stage, the peculiar and perverse rule supreme. Starring Olivia Porter and Jarred Dewey, Party Ghost brings together a cavalcade of tricks that will make you ooooh and ahhhh and laugh out loud. This duo focuses largely on clowning, but not your typical kinda clowning: here, the clowns relish in sociopathic slapstick while wearing blank stares and blonde wigs. And it’s the kind of clowning where you grimace and giggle at how quickly it escalates with evil intent. Don’t feel guilty laughing – this show is purposefully twisted, just like you. Highlights include aerial work in monster heels while weeping, a spoken word sequence filled with tutting (the dance move, not the sound of disapproval) and basically anytime Porter and Dewey run around in ghost sheets. The climax comes with a wonderful rendition of Hello by Adele that is so silly that when the tone finally flips, you find yourself caught between cowering and cheering. While some parts of Party Ghost could have admittedly been a little stronger and / or tighter, this is an experiment in circus that thoroughly works. The sustained tone of ghoulish fun is sustained throughout while Porter and Dewey relish in tormenting each other with devilish aplomb. If you’re looking for something that will start your evening’s entertainment off with a boo and a bang, then Party Ghost is for you. N.B. Party Ghost uses extended sequences of strobe lighting.